I first noticed some reports of the plausible link (related paper) between lead exposure and crime rates a while ago, but Mother Jones recently ran a well-written article by Kevin Drum that everyone should read, summing up the case so far. We've known for a long time that lead is toxic and harmful to mental health, particularly in children, but it's only within the past few decades that we've come to understand that there is no safe level of exposure at all. This link may be one of the most significant public health and safety discoveries of the past fifty years, and it's a shame that it has received so little attention in the past. Hopefully that will change now. It's pretty easy to see that there's been a massive improvement in just those ten years. 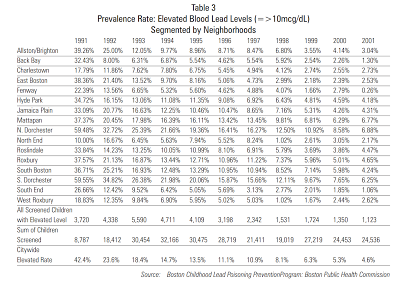 However, Dorchester and, for most years, Mattapan had the highest incidence of elevated blood lead levels. I don't know why this was the case. Lead exposure in the 20th century seems to have originated first from the use of lead in housing materials (such as paint), and then later from leaded gasoline used in cars. Dorchester and Mattapan have their fair share of older homes, but so does most of Boston. The Southeast Expressway was constructed in the 1950s, just in time for the gasoline-lead epidemic, and is adjacent to Dorchester and Mattapan. 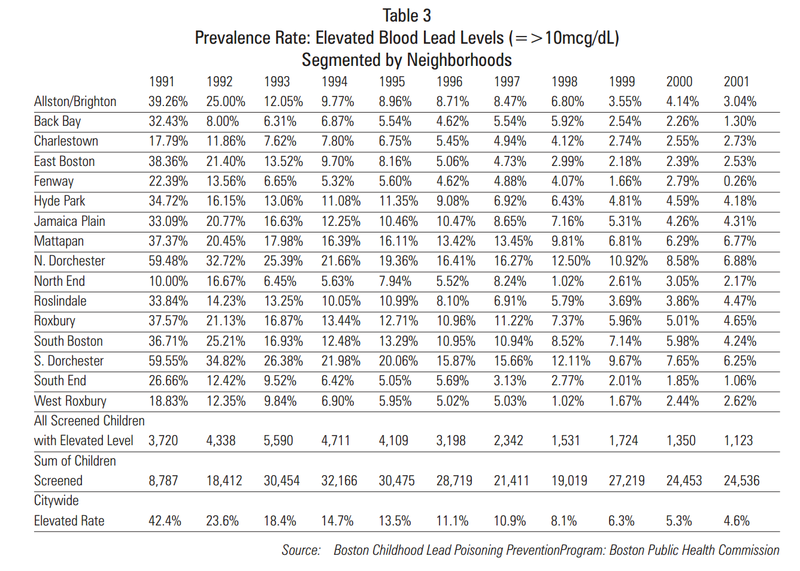 But the North End and Charlestown are also adjacent to large highways, yet they see some of the lowest levels of blood lead in the city. They are also both built environments that date back to colonial times. 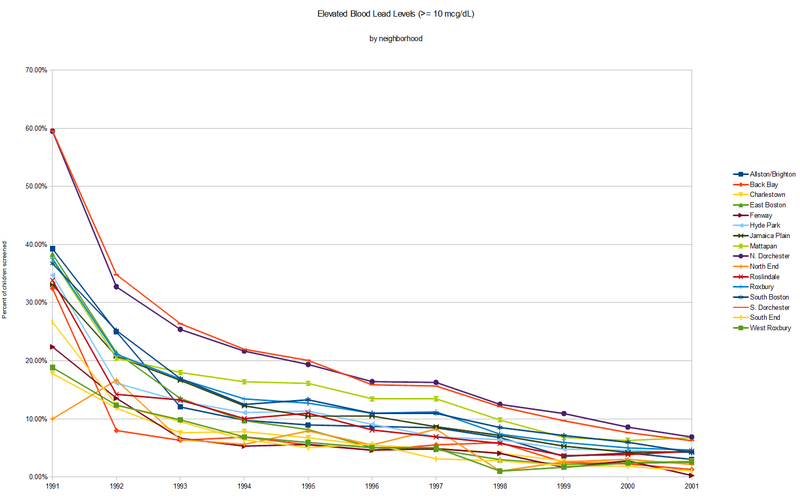 I was unable to locate any more specific data on soil or other environmental sources of lead in Boston. There is a state website to find out specific buildings' inspection status, but that seems to be it, at least on public websites. 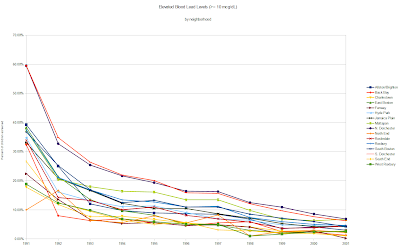 A major flaw with the above data is that it only counts 10 mcg/dL as "elevated" but more recent guidelines suggest 5 mcg/dL as the threshold, and others suggest that any amount is too much. So it's quite possible the picture changes when you add the children who are at-risk with 5 or less mcg/dL of blood lead. Another flaw is the arbitrary choice of (BRA-determined) "neighborhood" as the geographical unit. For example, Dorchester is a very large neighborhood. Even when split (by the BRA) into "north" and "south", it is still a vast and diverse place with a large potential variance in lead levels between areas. In Bowdoin-Geneva, a 68-block swath of Dorchester set between the rivers of traffic on Columbia Road and Dorchester Avenue, spring brings the usual signs of renewal. But it also brings something more sinister. It is a prelude to summer, which plays out year after year in this neighborhood against a backdrop of danger and a soundtrack of gunfire. It is a problem that seems to simply never go away. The rate of shootings here over the last 25 years is four times what it is in the city as a whole — averaging 24 a year in the last decade. No one seems to know exactly why. The drugs that spawned deadly territory fights two decades ago are no longer the primary fuel. Poverty, assumed by many to be a progenitor of violence, is much less severe than it was a generation ago and less prevalent than in some other Boston neighborhoods. And there is this not-very-well-known fact: Gangs were in Bowdoin-Geneva long before the neighborhood became what it is today — at least as far back as the 1950s, when bands of white kids claimed street corners, wore identifying colors, and assigned themselves names. They most often fought with their fists then, not with guns. But, as though a legacy handed to succeeding generations, gangs have remained even as the income, race, and social makeup of the neighborhood have changed. Bowdoin-Geneva now is an intricate architecture of alliances and loyalties based on little more than streets where boys and young men live. Slights real and perceived trigger violence between them. According to statistics from the city, the number of new lead poisoning cases declined from 1,300 in 2000 to 460 last year. The cases are mostly found in pockets of Dorchester, Roxbury, Mattapan, and Hyde Park. The highest concentration appears to be in neighborhoods in Dorchester's Bowdoin-Geneva Street area. In my unscientific opinion, lead poisoning is the prime suspect behind the troubles in this neighborhood. I would be interested to see the data that the city has apparently collected, and whether anyone is pursuing this topic more rigorously. As the days lengthen and temperatures rise, the city too is looking to Bowdoin-Geneva. It has tried fitfully since the 1970s to find a cure for the troubles here. Now, after a spate of murders last year, the city is trying again, with a vow that this time it will make a lasting impact. If they want to fulfill that vow, instead of just repeating it every year, then I would recommend a heavy investment in lead abatement---much more than already exists---for this neighborhood. It will take money as well as time, and will probably not feel as satisfying as hiring more police officers. But all the available evidence seems to say that it will work, and more than pay for itself as an investment in the next generation. I didn't realize there was an example right here in Boston. The Mother Jones article talked about lead recirculating into the atmosphere during dry spells, among other things. I wonder if there are any steps that individuals can take to mitigate lead exposure.